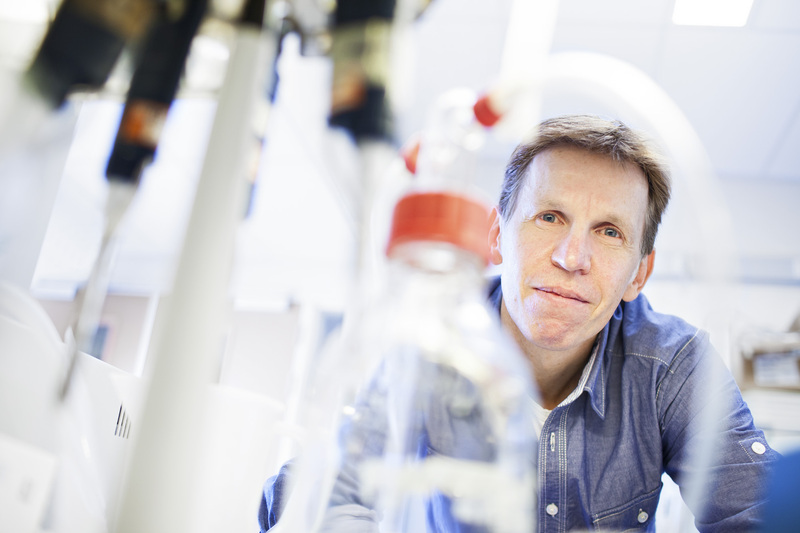 Immunologist Ton Schumacher from the Netherlands Cancer Institute in Amsterdam is being honored with the 2015 Meyenburg Award, which carries a €50,000 monetary prize. He receives the award for his excellent work on mechanisms of immune defense against cancer. Schumacher was able to show in seminal studies that successful immune defense against cancer depends on altered protein structures that form in tumor cells as a result of genomic mutations. The Meyenburg Award was presented on Wednesday, November 11, 2015, at a symposium held at the German Cancer Research Center (Deutsches Krebsforschungszentrum, DKFZ) in Heidelberg. The idea of fighting cancer with the weapons of the body’s own immune system is intriguing. However, only after scientists had succeeded, in 2010, in releasing certain “brakes” of the immune system have oncologists been able to achieve the first positive treatment outcomes with immunotherapies. By now, drugs against several of these “immune brakes” have become available and are successfully used to prolong the survival of patients in numerous types of cancer, in some cases even in advanced stages of the disease. How do immune cells distinguish between healthy tissue and cancer cells? Gene mutations, which are found in large numbers in cancer cells, can result in the formation of altered proteins. These protein variants are called “neoantigens”, because they newly arise in the course of the disease. Researchers have postulated for a long time that they are ideal targets for immune cells, because the immune system recognizes these new structures as foreign and has not yet developed tolerance towards them. This would also mean that immunotherapy might be more effective in controlling cases of tumors that exhibit very large quantities of mutations. Ton Schumacher was able to prove that this link does in fact exist. In one of his studies, he compared tumor cell genomes from many lung cancer patients and discovered that immunotherapies were most effective in cases where the cancer cells exhibited particularly large quantities of neoantigens. For example, immune cells that target neoantigens can be detected in patients’ blood. Physicians can thus determine early on whether immunotherapy is likely to be effective and whether a patient activates sufficient levels of specific killer cells against the tumor. The tumor neoantigens that are targeted by the immune system vary from one patient to the next. Therefore, immunologists plan to identify the major neoantigens of each individual tumor. On this basis, patients’ immune cells may be engineered to recognize the neoantigens and attack their tumor. Ton Schumacher did his PhD from 1988 to 1992 at the Netherlands Cancer Institute in Hidde Ploegh’s laboratory and then for a short time moved to the Massachusetts Institute of Technology together with Ploegh, where he pursued research as a postdoc. Schumacher subsequently continued his research in Peter Kim’s group at the Whitehead Institute in Cambridge, USA. Since 1996, he has worked at the Netherlands Cancer Institute, where he currently serves as a Senior Member. Schumacher has been honored with a number of awards including the Pioneer Award, the Amsterdam Inventor Award and the Stand up to Cancer-Dream Team Award. He is an EMBO Member and was awarded an “Advanced Grant” by the European Research Council in 2010. The Meyenburg Foundation, which is based at the DKFZ, has awarded the distinction since 1981. This year’s award will personally be presented by Dr. Marion Meyenburg, daughter of founders Wilhelm and Maria Meyenburg, at the end of the symposium. The Meyenburg Award honors outstanding achievements in cancer research. It is presented annually and is accompanied by one of the highest monetary prizes in German science. The importance of this award is also reflected in the fact that numerous laureates have gone on to win a Nobel Prize: Andrew Fire, who won in 2002, received a Nobel Prize for Medicine in 2006. Elizabeth Blackburn, laureate of 2006, became a Medicine Nobel Prize winner in 2009. Shinya Yamanaka, Meyenburg Award winner of 2007, also received the Nobel Prize for Medicine in 2012. Stefan Hell, winner of 2011, received the Nobel Prize for Chemistry in 2014. The symposium was held on November 11, 2015, in the DKFZ Communication Center. Among the speakers was Michel Sadelain from Memorial Sloan Kettering Cancer Center in New York, who played a major part in developing CAR-T cell immunotherapies. A Poetry Slam Show by Max Kennel and Julian Heun provided a change from the subject of science. Interested members of the public were welcome to attend the event.